Courtesy | Sarah J. Hardt Animal rights activist Sarah J. Hardt took these photos while on a trip to Utah to see the journey that pigs took from Circle Four Farms in Iron County to a Los-Angeles slaughterhouse. Courtesy | Sarah J. Hardt Animal rights activist Sarah J. Hardt took these photos while on a trip to Utah to see the journey that pigs took from Circle Four Farms in Iron County to a Los-Angeles slaughterhouse. 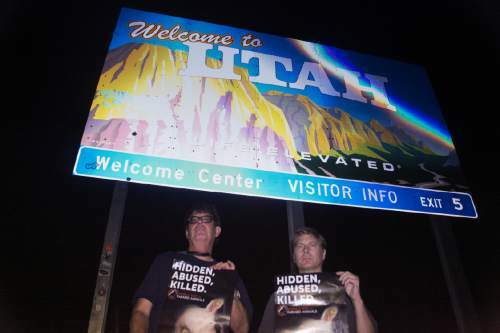 Utah prosecutors are dropping charges against four animal activists filed under a controversial law known as "ag-gag." The activists from California and Maryland will still each face one misdemeanor count of criminal trespass, said Iron County Attorney Scott Garrett on Monday. Prosecutors received the case after the four activists pleaded not guilty last week. The charges being dropped came under a law that makes it a crime to conduct undercover investigations of slaughterhouses and factory farms. It&apos;s being challenged by activists who say it was designed to prevent exposure of unsafe practices. Six other states have similar measures, but the only other person to face charges was also from Utah, according to Matthew Liebman, a lawyer from the Animal Legal Defense Fund, a group suing to strike down the law. 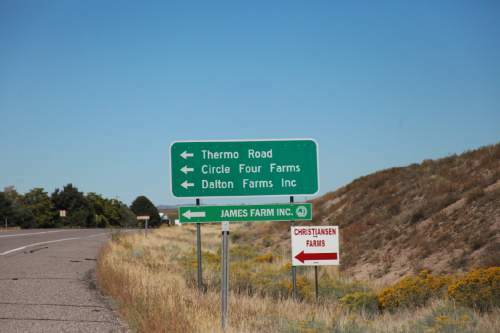 Police say the four activists from the Farm Animal Rights Movement drove onto private property at southwestern Utah&apos;s Circle Four Farms in September and took pictures. Their lawyer says they were on a public roadway and only captured images of farm buildings, not workers or animals. Attorney T. Matthew Phillips has said his clients were trying to retrace the pigs&apos; path to a California slaughterhouse, not trying to provoke an arrest. They are Sarah Jane Gage, 43, of Los Angeles; Robert Penney, 64, of Laguna Beach, California; Harold Weiss, 34, of Pasadena, California; and Bryan Monell, 50, of Mount Rainier, Maryland, according to court records. Phillips didn&apos;t immediately return a message seeking comment Monday.